Take every plot element from the LOTR films, mix them up at random, make the storyline less comprehensible, and – voilà – you have “The Hobbit”. 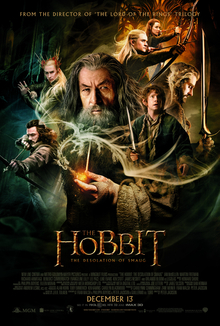 ”The Desolation of Smaug” is the second of three “Hobbit” flicks, in which the brave hobbit Bilbo of the Shire and a group of dwarves attempt to steal back a priceless jewel from the sleeping dragon Smaug. While the little people are busy chasing their trinkets, the wizard Gandalf the Grey discovers the true identity of the Necromancer. It's really Sauron, who for the nth time is back to destroy the world for no better purpose than his own darker amusement. There are a lot of orchs and trolls in the story, too, so many in fact, that they become positively annoying after one hour and a half!